Gonzaga has motored through the first nine games of its West Coast Conference schedule, compiling a historic winning margin along the way. Will Saint Mary’s offer more resistance or join the eight others in the fourth-ranked Zags’ rear-view mirror? Gonzaga has outscored conference foes by 263 points, surpassing Belmont (237 in 2011) and the 2017 Zags (233) for the most since 1998, according to Ken Pomeroy. The 2018 Zags rank tied for fifth at 215 points. 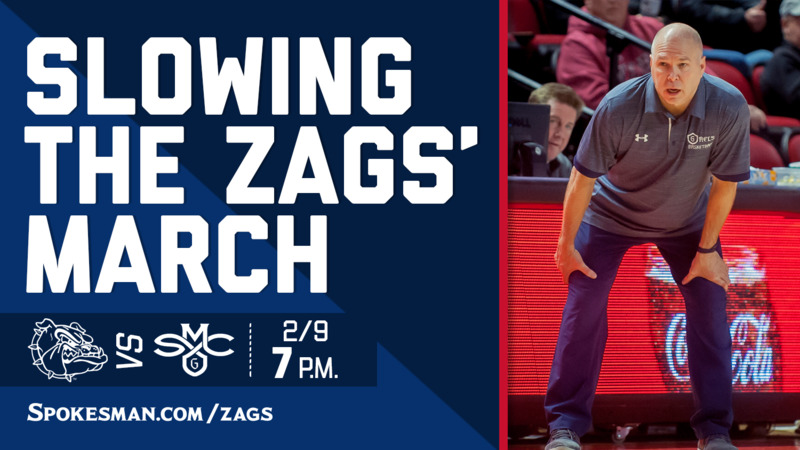 The Zags and Gaels stage the first of their two meetings – Gonzaga has already swept Santa Clara and San Francisco – Saturday at the McCarthey Athletic Center. For all the chatter about Saint Mary’s (15-9, 6-3 WCC) and BYU (15-10, 7-3) being down this season, they’re still tied in the loss column for second place, three games behind the Zags (22-2, 9-0). The Gaels bounced back from losses to BYU and Pepperdine with wins over San Francisco and Pacific. Junior guard Jordan Ford is the top scorer in the WCC at 22.1 points. Sophomore forward Malik Fitts, a transfer from South Florida, averages 16.2 points and 7.6 rebounds. Nobody else averages in double figures, with the scoring dropping off to Jordan Hunter’s 9.0 points per game. Ford and Fitts have combined for 93 3-pointers. Fitts scored 30 points to spark the win over USF. Saint Mary’s is No. 45 in the NET rankings, second among WCC programs behind Gonzaga’s No. 2. San Francisco, thumped by the Zags 92-62 on Thursday, dropped two spots to No. 52. Bennett said the Gaels’ to-do list includes taking care of the ball, limiting GU’s transition game and hold their own on the boards. The game coincides with the GU recruiting visits of guard Jalen Suggs and wing Julian Strawther. The 6-foot-4 Suggs, who is from Minneapolis, is No. 9 on 247sports.com’s 2020 class rankings. The 6-7 Strawther, who plays at Liberty High in Las Vegas, is No. 36. Gonzaga senior point guard Josh Perkins continues to climb up the program’s all-time lists. His 639 career assists trail second-place Blake Stepp by one. Perkins has 234 career 3-pointers, nine behind No. 5 Derek Raivio. Published: Feb. 8, 2019, 9:54 p.m. Updated: Feb. 8, 2019, 10:37 p.m.